This is a version of the post below, revised so as to try to eliminate a number of confusions. The Wikipedia article Argument (linguistics) starts its discussion of the argument/adjunct distinction by asserting that an argument is what is demanded by a predicate to complete its meaning, while an adjunct is not so demanded. For example, if someone asks me “What is Joe eating?” my answer would be drastically incomplete if I replied “eats.” My answer would still be drastically incomplete if I supplied just one argument, ‘Joe’, to say ‘Joe eats.’ Only when I supply a second argument, say, ‘a fried egg’, would my reply not create a sense of a question ludicrously left hanging and an answer simply not given. The predicate _eats_ has two parameters ( shown here as ‘_’) demanding two arguments, such as ‘Joe’ and ‘a fried egg’ for my reply to make any sense. ‘[I]n the kitchen’, however, is an adjunct, since nothing would be left ludicrously left hanging in the air were I to leave that phrase out of the proposition “Joe eats a fried egg in the kitchen.” The predicate eats does not have a parameter demanding something like ‘in the kitchen’ as an argument. This criterion — i.e., what is demanded by a predicate to complete its meaning … henceforth I will call this the ‘demands criterion’ — runs into trouble when one notices that sometimes eats demands two arguments, but sometimes demands just one. One might say: “Joe goes into the kitchen. Joe is ravenous. Joe sees food. Joe eats.” ( Imagine a novelist or short-story writer working in a certain style.) The argument ‘a fried egg’ is not demanded in this particular piece of discourse. But if ‘a fried egg’ is an argument, not an adjunct to eats, it would seem one would have to abandon the ‘what is demanded by a predicate to complete its meaning’ criterion and find another criterion for what is to count as an argument and what is to count as an adjunct. This a contributor (doubtlessly not the same person who put forward the ‘demands’ criterion) to the Wikipedia article cited above tries to do. But if one wants to retain the demands criterion, they (I am intentionally using ‘they’ as a genderless singular pronoun) can assert that two different predicates, each with a different number of parameters, may get invoked when someone utters ‘eats’ in a stretch of discourse. Sometimes the one-place predicate _ eats is invoked, sometimes the two-place predicate _eats_. Which predicate one uses is optional, depending upon what they feel is called for by the situation and what they want to do with the predicate. Sometimes the context forces one to use, for example, the two-placed predicate (for example, in answer to the question ‘Joe is eating what?’; sometimes which predicate one invokes is purely a matter of choice. If all of the predicates demand a certain argument (for example, ‘Joe’ in ‘Joe eats’), what is so demanded is an argument that is not also an adjunct. If not all of the predicates demand a given argument (‘fried egg’, ‘in the kitchen’), that argument is an adjunct. In this way, the demands criterion is rescued. Here the relation formed by _eats_ is a subtype of the supertype formed by _eats. That is to say, PERSON_EATING is a unique key in this relation, but it is also a foreign key to the PERSON_EATING attribute of the relation formed by _eats. This means of, course, that in each tuple there is just one thing that the person is eating. This constraint would be natural enough if one restricts the now of the present tense eats enough so that only one thing could possibly be getting eaten, for example, the egg one piece of which Joe is now bringing to his mouth via a spoon. But, of course, if one stretches out this now enough so that our hypothetical author could write: “Joe goes into the kitchen. Joe is ravenous. Joe eats a fried egg, an apple, and a salad,” one could not treat the one-place relation as a subtype of the two-place relation. I think the solution in this case would be to treat what gets eaten as a meal, a meal comprising one or more items. The meal then could be treated relationally the way an order and its order-items get treated, the orders going into one relation, and orders and order-items going into another, with the orders and order-items together comprising a unique key. The predicate _eats_ _ (as in ‘Joe eats the fried egg in the kitchen’) can be treated the same way. And so on for any number of possible adjuncts that a predicate might accept. If I can get away with this move, then, an adjunct would be any argument that is 1) accepted by a predicate in which the corresponding relation is a subtype of another relation, and 2) the parameter which takes that argument corresponds to an attribute in the subtype relation which is not a foreign key of the supertype relation. An adjunct then is one kind of argument. Non-adjunct arguments (arguments that are just arguments, arguments simpliciter) correspond to a unique key in a supertype relation; adjuncts in turn are arguments not corresponding to any attributes in the subtype relations that are foreign keys to that unique key in the supertype relation. Here PERSON_EATING is a not-null column, and FOOD_ITEM_BEING_EATEN is a “nullable” column. This looks like a single relation with an optional parameter (FOOD_ITEM_BEING_EATEN). So if one both accepts the demands criterion and takes the SQL table as their cue, PERSON_EATING would be an argument because it is not optional, i.e., always demanded and FOOD_ITEM_BEING_EATEN would be an adjunct because it is optional. But then one has no way of accounting for when FOOD_ITEM_BEING_EATEN isn’t optional — for example in answering the question ‘what is Joe eating’? (Compare with the COMMISSION column in the EMP table of Oracle’s sample SCOTT schema when the employee is a salesman.) One would either have to try to explain away — an impossible task? — the times when eats surely seems to demand not one, but two arguments, or they would have to give up the demands criterion as the way to distinguish between arguments and adjuncts. But of course SQL is confused. The SQL table above is mushing together two different relations, the relation formed by _eats and the relation formed by _eats_. Disentangle the two relations, and you get a two-fer. You get rid of the nulls, and you also rescue the demands criterion for distinguishing between arguments simpliciter and arguments that are adjuncts. When you disentangle the relations, you can see that what is optional, when one is talking about adjuncts, is not the attribute value (e.g., fried egg), but which predicate one invokes when they say eats. To put it a different way, the attribute value is optional only because the predicate is. I submit, then, that treating a verb as invoking different predicates whose corresponding relations are involved in subtype/supertype relationships does away with the confusing situation that challenges the demands criterion: i.e., the initially confusing fact that sometimes an argument seems to be demanded for the verb, and sometimes it seems not to be. 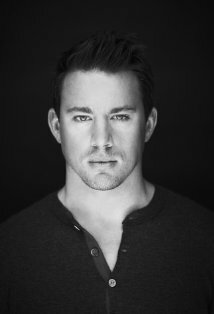 Today’s homage to Plato’s SYMPOSIUM is Channing Tatum (aka Magic Mike) again, as in the previous post. How can anyone get anything done with such beauty walking the earth? The Wikipedia article Argument (linguistics) starts its discussion of the argument/adjunct distinction by asserting that an argument is what is demanded by a predicate to complete its meaning, while an adjunct is not so demanded. For example, if someone asks me “What is Joe eating?” my answer would be drastically incomplete if I replied “eats.” My answer would still be drastically incomplete if I supplied just one argument, ‘Joe’, to say ‘Joe eats.’ Only when I supply a second argument, say, ‘a fried egg’, would my reply not create a sense of a question ludicrously left hanging and an answer simply not given. The predicate _eats_ demands two arguments, such as ‘Joe’ and ‘a fried egg’ for my reply to make any sense. ‘[I]n the kitchen’, however, is an adjunct, since nothing would be left ludicrously left hanging in the air were I to leave that argument out of the proposition “Joe eats a fried egg in the kitchen.” The predicate eats does not demand that argument. This criterion — i.e., what is demanded by a predicate to complete its meaning … henceforth I will call this the ‘demands criterion’ — runs into trouble when one notices that sometimes eats demands two predicates, but sometimes demands just one. One might say: “Joe goes into the kitchen. Joe eats.” ( Imagine a novelist or short-story writer working in a certain style.) Although one could just as well say “Joe goes into the kitchen. Joe eats a fried egg”, the argument ‘a fried egg’ is not demanded in this particular piece of discourse. So if one wants to maintain that the predicate eats takes two arguments, they would have to abandon the ‘what is demanded by a predicate to complete its meaning’ criterion and find another criterion for what is to count as an argument and what is to count as an adjunct. This a contributor (doubtlessly not the same person who put forward the ‘demands’ criterion) to the Wikipedia article cited above tries to do. But if one wants to retain the demands criterion, they can assert that two different predicates may get invoked, depending upon the context, depending upon the circumstances, when someone utters the word ‘eats’ in a stretch of discourse. ( I am not clearly distinguishing between predicate and word here; perhaps I don’t necessarily need to just right here.) When one invokes the predicate in order to answer the question ‘What is Joe eating?’, invoking the predicate creates a proposition, or tuple, in a 2-place relation. In circumstances in which nothing is left ludicrously hanging in the air when one says ‘Joe eats’, the predicate creates a proposition, or tuple, in a 1-place relation. There are two different predicates that may get invoked when one utters ‘eats’. And depending upon which predicate gets invoked, ‘a fried egg’ is either an argument or an adjunct. Here the key is, of course, PERSON_EATING. Sometimes what Joe eats is a ‘core element of the situation’, sometimes it is not. In a possible world there exists a tribe for whom the amount of energy pounded into the ground by John’s running is a core element of the situation runs, such that something is left ludicrously hanging in the air when one simply says ‘John runs’ and not (to invent a new syntactic marker, ‘tha’, which expresses ‘the energy absorbed by the ground when John runs”’, just as ‘to’ expresses ‘the place to which John ran’ ) ‘John runs tha 1,000 <<some unit of energy>>’. Yes — there is a certain oddness, a certain ugliness, to having Cliff suffer from two “null values”. Maybe there is something fishy about the SQL idea of a “null value”? But the SQL table does convey the idea that an adjunct is an optional value, while an argument is required. After conveying this idea, we can get rid of the SQL table with its dubious nulls and replace it with the two-place relation EATS whose PERSON_EATING attribute is a foreign key to the one-place relation. Once can of course add other adjuncts by creating new relations. Here of course, the key is PERSON_EATING, FOOD_ITEM_BEING_EATEN, and IN_ORDER_TO. Here I envisage the demi-urge performing the needed projection by ignoring the FOOD_ITEM_EATEN attribute (perhaps even forgetting there is such an attribute in the relation), then, in order to avoid duplicates (we don’t want our demi-urge to be seeing double! ), collapsing what had been two appearances of Cliff into just a single appearance. Notwithstanding all of my rapturous sighs at the moment, my sole interest in Magic Mike is, of course, as a stepping stone first, to the Relational Algebra, and then, ultimately, to the Platonic Form of Beauty.